St James' Park is located in the centre of Newcastle, with its white cantilever roof visible across the city and it's the largest cantilever in Europe. 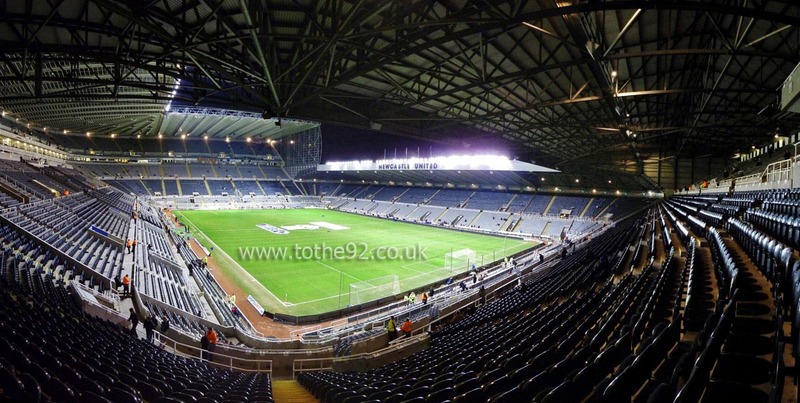 The Toon Army fan-base occupy the Milburn Stand, the East Stand, the Sir John Hall End and the Gallowgate End, whilst the traditional home of the more vocal fans is considered to be the Gallowgate End, in the same vein as The Kop is at Liverpool. Visiting supporters have now been moved from the North West Corner to the North East Corner of the old Sir John Hall End (behind the goal). An allocation of 3,000 places is set aside for league games. 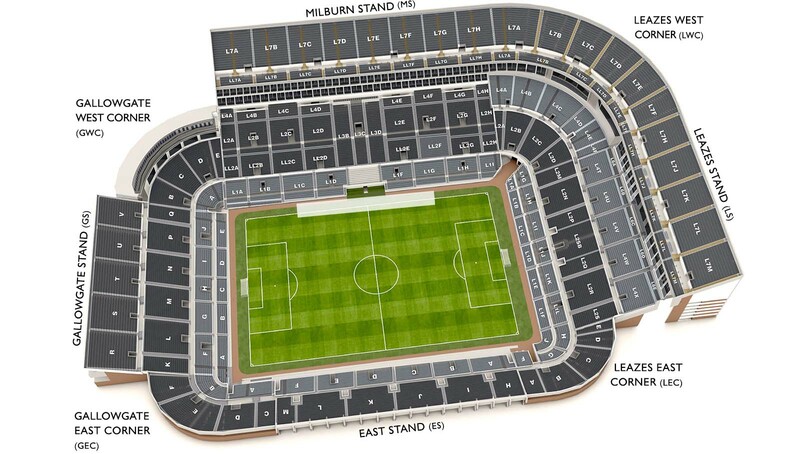 For Cup games when a larger allocation is required, the lower section of the north east Corner is also allocated. Although high up, the views are fantastic both of the action and over the city. Facilities are very good and very well priced. Those walking up from the railway station or exiting St James Metro Station will approach from the south. The Newcastle Arms on St Andrews Street has a changing selection of ales as well serving some cold food. Also on St Andrews Street is The Back page which is a must for anybody with an interest in football memorabilia, with thousands of books, programmes and other items from virtually every league club. All of the major fast food outlets you'd expect can be found within walking distance of the stadium, including Burger King on Westgate Road and McDonalds on Northumberland Street. Takeaway Pizza and Kebab joints can be found in the Bigg Market and along Percy Street, while there's a Pizza Hut on Grainger Street. There are many pay and display car parks in the local vicinity although the multi storey at the stadium is very limited on match days. The Royal Victoria Infirmary on Queen Victoria Road offers a car park at reasonable prices and allows for a quick escape after the game if you're back to your car before the rush. Street parking is virtually non existent around the city. It is available however, providing you're willing to walk 15-20 minutes back to the stadium. The nearest / closest train station to Newcastle United's St James' Park is Newcastle Central - a 15 minute walk from the ground. GNER train services connect Newcastle Central Station to London and Scotland, with Virgin cross country routes to Scotland, the midlands and South West England also available. Details at Trainline. The nearest station on the Tyne and Wear Metro system is St. James, but if arriving from the airport, alight at Haymarket or Monument Stations and follow the crowds! It's only a five minute walk from either. Travel: Drove on every visit…, takes forever and parking at the brewery opposite is great until it comes to getting out after the game. Then you can grow old waiting. Refreshments: Immediately around the ground, not much really. Couple of pubs, but they never seem all that welcoming for us. Probably because Newcastle are so close to the city centre, the away fans naturally just spread out, rather than all ending up in the same places. Impressions: Take an oxygen tank you're on level 7 up in the Gods, and you will need recovery time when you get to the top! Under the stand is spacey and they have TVs etc. but the view from the seats takes the mick. It's like watching a game of Subbuteo. Atmosphere: Rubbish. Couple of scallies on the other side of the divide shouting abuse and that's it. Generally one of our worst showings of every season too for some reason. Enjoy: I hate going there! 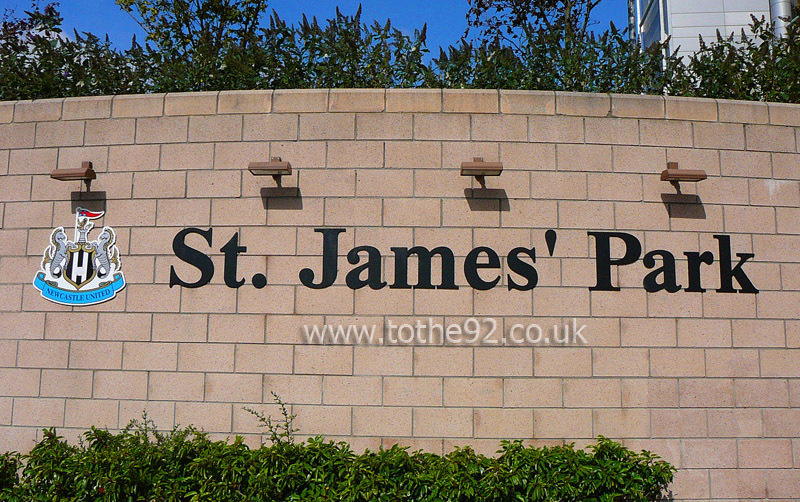 Have you been to Newcastle United's St James' Park? To tell us about your experiences and to feature on the site, simply complete the fans review form below!